Calculates commissions and total cost of sales at various achievement levels. Designed for smaller companies with limited pay-for-performance structure. Available online or in Excel. While virtually all sales reps are assigned some sort of quota, this tool enables a small business sales manager or CEO to employ more structure and expectations attached to that quota. BizCompare.com, which publishes detailed company profiles of 1.5 million U.S. companies in the business services vertical, is pleased to announce the availability of their free online Sales Compensation & Commission Calculator. 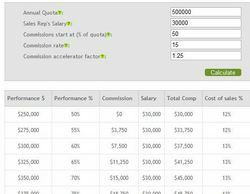 This calculator provides a user with a way to quickly and accurately calculate variable and total sales compensation based on 5 key variables. Essentially a cost of sales tool, it’s designed for smaller companies who do not have a formal performance management methodology for their sales reps nor have the expertise to create one. The online calculator is accompanied by a suggested sales strategy and is also available in an Excel spreadsheet. “While virtually all sales reps are assigned some sort of quota, this tool enables a small business sales manager or CEO to employ more structure and expectations attached to that quota,” says Geoff Vincent, CEO of BizCompare.com. “Now they can more clearly communicate minimum performance requirements, rewards for over achievement and what all of that means in terms of a rep’s earning potential.” Generally speaking, sales reps are very motivated by their compensation and this tool allows them to calculate their financial rewards. As a cost of sales calculator, the CEO or CFO of a small company can use it for planning, budgeting and forecasting to ensure they are only for paying for performance, not the lack of it. The online calculator is free to use and by request is available in an Excel spreadsheet. In the near future, it will also be available as a free download to operate on any site. “We think this is a great tool that anyone can use to help better manage their business. So we are developing it to be easily hosted on other sites,” says Vincent. Available by the end of February, it will include the option to change colors to match host site color palettes. The BizCompare.com site is owned and managed by BizCompare Inc. which was founded in 2010 and is based in Mississauga, Ontario, just west of Toronto. The BizCompare.com site consists of company info on over 1.5 million U.S. businesses who are primarily involved in the business services sector. Also featured are over 100 Industry Research Reports. Site users are looking for information on various business services industries and the companies that may provide these services. Key features of the site include peer group comparative information presented in text and graphs. For more information go to http://www.bizcompare.com or call 647-220-2515.